"The 21st century is not yet a dozen years old, and there are already 1 billion more people than in October 1999 — with the outlook for future energy and food supplies looking bleaker than it has for decades. It took humanity until the early 19th century to gain its first billion people; then another 1.5 billion followed over the next century and a half. In just the last 60 years the world's population has gained yet another 4.5 billion. Never before have so many animals of one species anything like our size inhabited the planet." 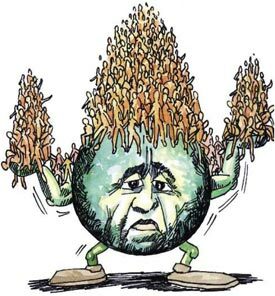 "Overpopulation is taking a toll on our planet." While global warming has taken center stage in our environmental concerns, population levels will have a much greater impact on our children than the threat of a shrinking ozone layer. "There are two major trends in world population today. On the one hand, chronically low birth rates in developed countries are beginning to challenge the health and financial security of their elderly. On the other, the developing countries are adding over 80 million to the population every year and the poorest of those countries are adding 20 million, exacerbating poverty and threatening the environment." While population levels in developing countries are increasing, this environmental crisis isn't something that is going to continue to be someone else's problem. "Environmentalists have long been concerned about the resources threatened by rapidly growing human populations, focusing on phenomenon such as deforestation, desertification, air pollution and global warming. But the worst-case scenario for people experiencing overpopulation, according to Lawrence Smith, president of the Population Institute, is a lack of fresh, clean water. "That sounds kind of alarmist," Smith conceded, "considering there's water all around us, but 97 percent plus is saltwater, and the freshwater that we use to sustain ourselves is just native to 3 percent. … So the accessibility of water, the competition for water, the availability of water is going to be a major, major threat," he said, noting world population growth estimates at more than 9 billion people by 2050." While the near future of America may not look like something out of a Mad Max movie; and water may not be more valuable than gold; one thing is certain: the human population of the world is growing at a steady, and predictable pace. As can be seen in the chart below, in less than 40 years, our country will have grown by another two billion people. "Where we go, nature retreats. We are entering an epoch scientists have begun calling the Anthropocene, a break with the geologic past marked by humanity's long-term alteration of the natural world and its biota. We are inadvertently bringing on the sixth mass extinction not just because our appetites are vast and our technologies powerful, but because we occupy or manipulate most of the land in every continent except Antarctica. We appropriate anywhere from 24 percent to nearly 40 percent of the photosynthetic output of the planet for our food and other purposes, and more than half of its accessible renewable freshwater runoff." A few hundred years ago, mankind thought that the Earth was the center of the universe. We were wrong, of course. And today, by our own actions (if not our communal beliefs) humanity still considers itself the most important creature on our planet. If these numbers don't change, we will be proven wrong again; but no one will care. (1) 1996 World Population Data Sheet, Population Reference Bureau. (2) Contraceptive Use and Teenage Sexual and Reproductive Behavior, Facts in Brief, Alan Guttmacher Institute. (3) 1995 U.S. Statistical Abstract, p. 868. (4) The 1993 Information Please Environmental Almanac, World Resources Institute, p. 159. (5) Full House, Lester Brown and Paul Kane, p. 63. (6) Stabilizing the Atmosphere, Population Action International, p. 33. [WORDPRESS HASHCASH] The comment’s server IP (72.232.7.41) doesn’t match the comment’s URL host IP (76.74.254.120) and so is spam.